Craftsmanship relies upon the silent knowledge of the skilled experience of the creative workings of the hands, a knowledge that is difficult to convert to written characters without creating a blur of words that make very little sense. Theoretical reasoning lacks the dialogue with, and the resistance from, the raw material. 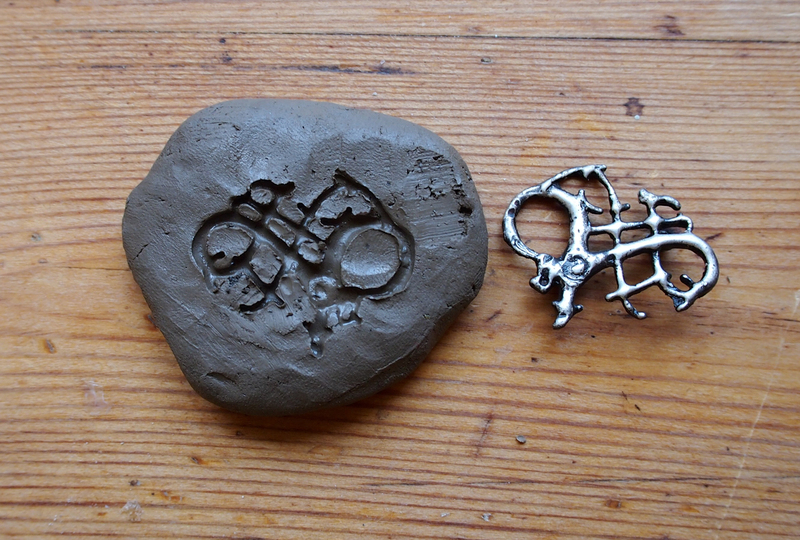 Making up a picture of how wax, clay and metal would behave without practical experience of them is next to impossible. You must work with the material directly to get proper answers. After nearly 600 recorded castings with reconstructed early medieval casting technology behind me, and just as many unrecorded, I may perhaps consider myself a craftsman almost as much as I am an archaeologist, and I would like to share a little of what I have learned from these experiences. 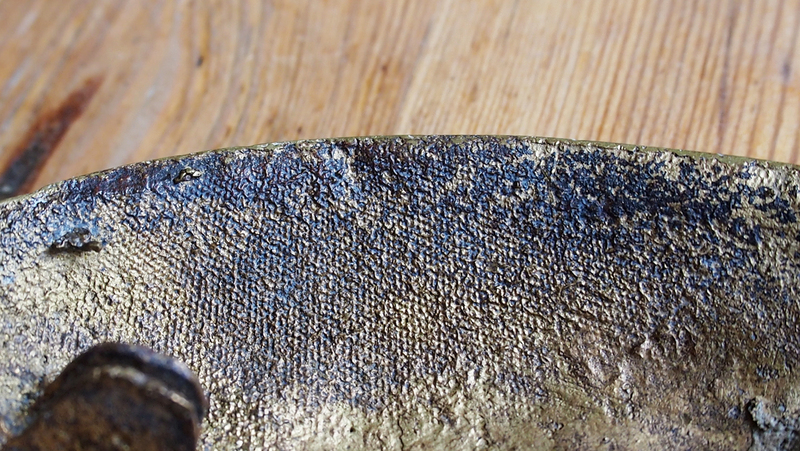 An intriguing phenomenon that sometimes occurs on Viking jewellery is textile patterns on the reverse. (...) The patterns are always positive which indicates that the textile must have been a part of the modelling and moulding process. (...) They are not impressions, but positive patterns in the cast metal. In this paper, I will discuss Viking period mould making and mass production of jewellery in the light of my own experimental experiences. I will make comparisons with a few published papers on the subject since the early 1980s, and test their suggestions concerning lost wax casting, mould making and methods of mass reproduction. This article is illustrated with photographs of my own reconstructions. 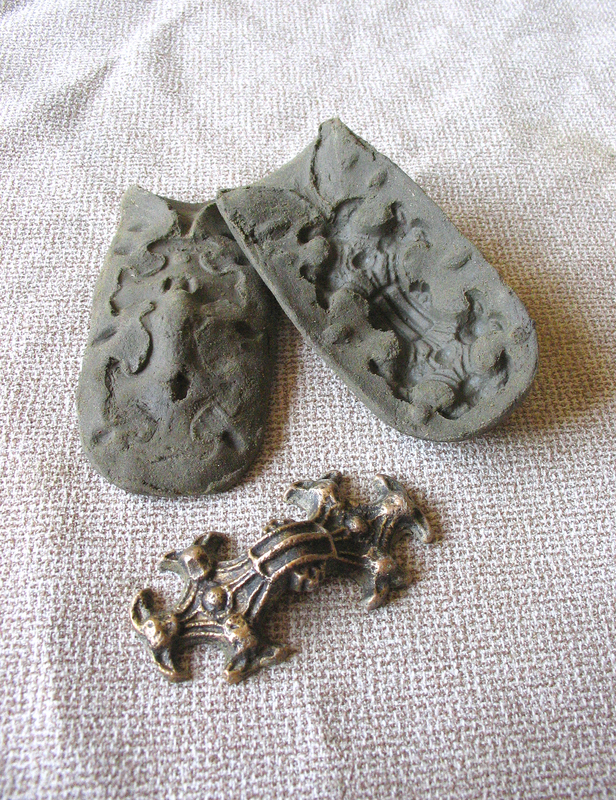 There are old, unfortunate standpoints that still are alive in archaeometallurgy, used as “truths”; the idea that lost wax castings do not leave two-part moulds behind, and that the method could mainly just be used to create unique pieces. 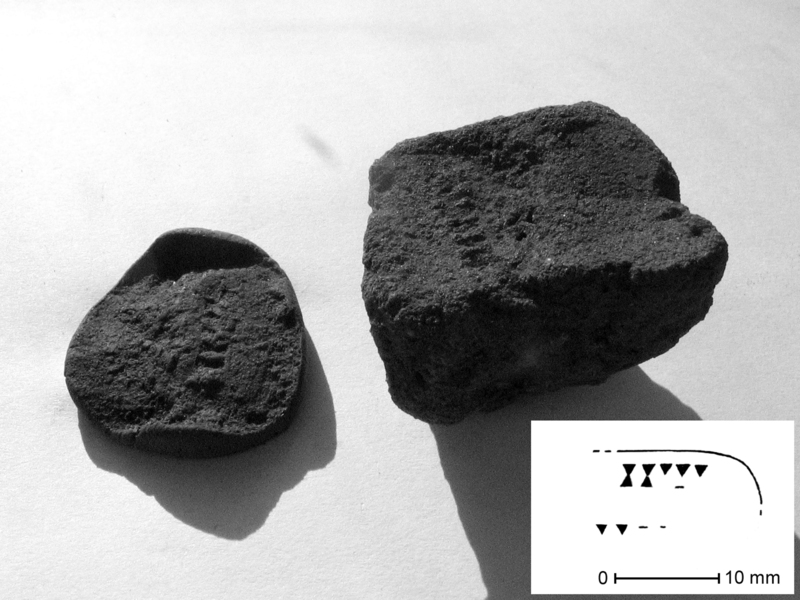 The formula “two-part mould – not lost wax” is a deceptive simplification and more of an obstacle than an aid when we try to understand archaeological workshop materials. In this paper, I will show that the reality is far more complex and that ceramic moulds that appear to be made as two-part moulds can actually emerge from lost wax casting. I will also try to explain that how we choose to identify the mould making technologies, will make crucial differences when we estimate the potential of early medieval jewellers' production capacity. Making the mould of a heat-resistant material; usually stone, sand or ceramic. When making a stone mould, you carve the negative cavity out of the stone by hand. When making a sand mould, you press a model in the sand and remove it prior to casting. When making a ceramic mould by the direct method in a two-part (or bivalve) mould, by pressing an original model into the mould material, the model is removed from the mould before firing it. The original model can be a metal model, even an old piece of jewellery that you want to reproduce. 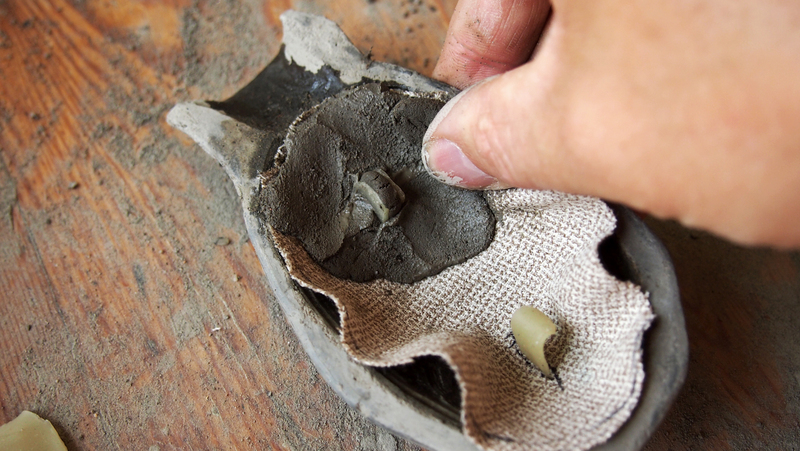 When making the mould by the lost wax method, the wax model is melted out of the mould prior to firing. The wax model may be a unique original that you have modelled in wax, or a mass reproduced wax model. The original model that you want to reproduce can be a metal model. When making moulds of tempered clay, they must be fired and turned into ceramic prior to casting. Pouring molten metal into unfired clay is dangerous, as it will release the clay's chemically bound water explosively. This water is safely released from the clay if you slowly fire it into a ceramic. Melting the metal in a crucible. Pouring the hot metal (1100–1150°C) into the hot mould (400–800°C). Opening the mould to get out the object from it. In stone mould casting and sand casting you simply open it, in lost wax casting you usually break it. Finishing the object by retouching flaws in the ornamentation and removing flashes created by unintentional pores in the mould and by the spaces between the mould's halves. 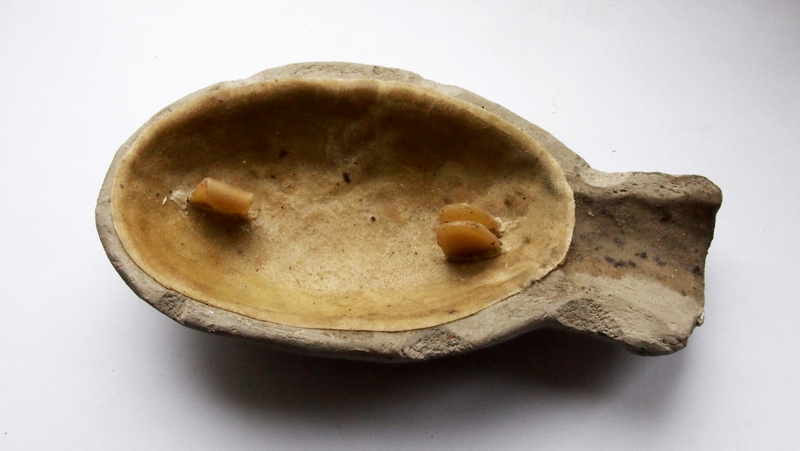 Contemporary lost wax casting is not made with two-part (or bivalve) moulds. You make them in one single part and you open them by breaking them. 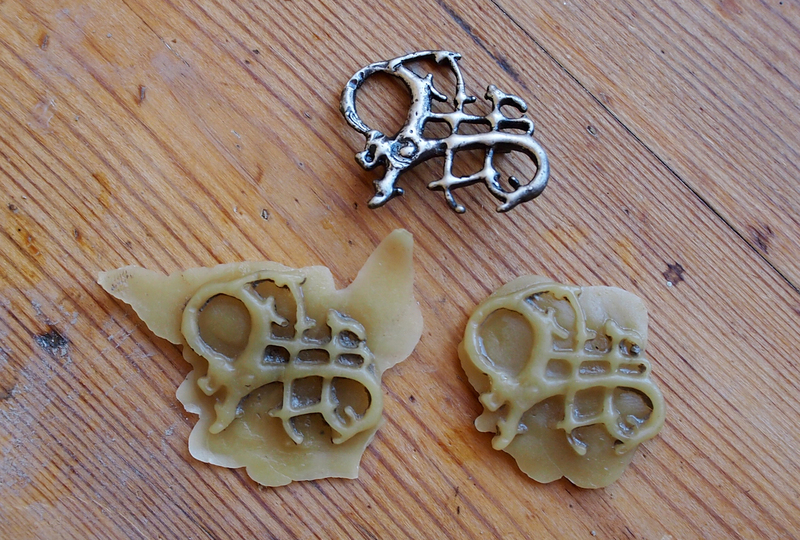 An important difference between modern and medieval lost wax casting that we must bear in mind is that today we use liquid mould materials, not the medieval craftsman's sluggish clay-mixes. This makes a huge difference to the methods of mould making. 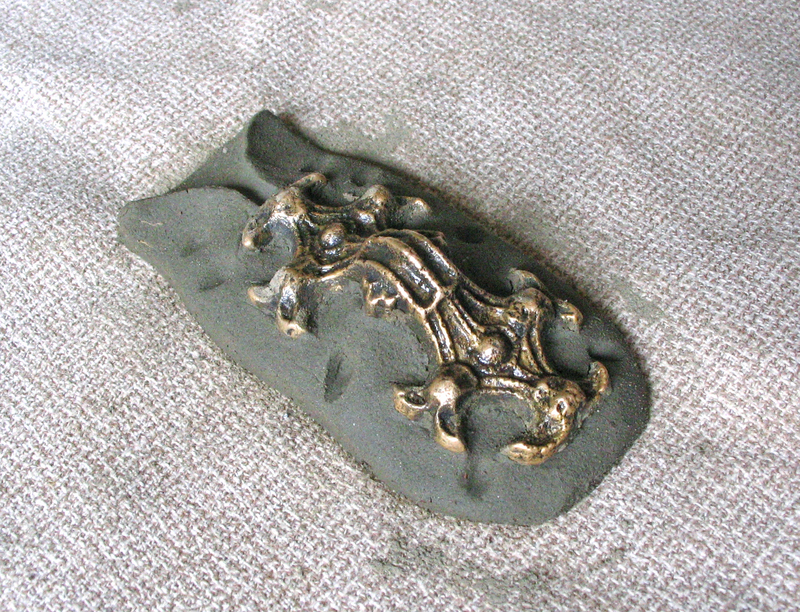 In present-day lost wax casting, you use a liquid plaster/clay/grog/water-material where the water burns with the plaster (with jewellery casting as well as in art foundry), or you dip the wax model repeatedly in a slurry of a liquid binder (usually colloidal silica) and pulverized fired kaolin, rolling the object in kaolin grog between the dippings. Then you fire the mould into a durable ceramic material prior to casting (ceramic-shell precision casting). In sand casting, you press the original model in the mould material. An early work actually suggested that Viking age jewellery could have been cast in sand moulds and that the ceramic moulds found may be the remains of petrified sand moulds (Korosuo, 1946). Today, we have access to a range of archaeological materials of ceramic moulds that most probably rule out the idea of Viking sand casting (cf. Lamm, 1972; 1980; Brinch Madsen, 1984; Jakobsson, 1996; Pedersen, 2010; Ambrosiani, 2013, pp.237 ff). But more than this, the division of two halves may be an unintentional result of the method of mould making itself. 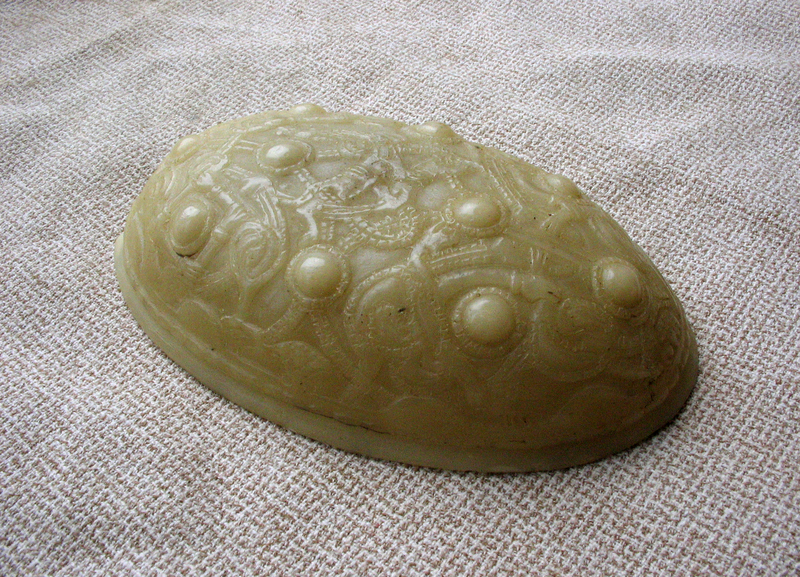 As mentioned, present-day lost wax mould making is made with liquid mould materials that easily can be poured over the wax model, or in which the model may be dipped. The medieval mix of clay, sand or silt, organic temper and water is a sluggish porridge that must be modelled onto the wax original. The tempering of the clay mix is necessary, to increase the moulds’ thermoshock resistance. It also decreases the shrinkage of the clay. Objects made of natural clay shrink approximately 10 % when drying, but the shrinkage is dramatically decreased by the temper. I usually see shrinkage of between 2–5 % from the original model to the end product in my own practice. 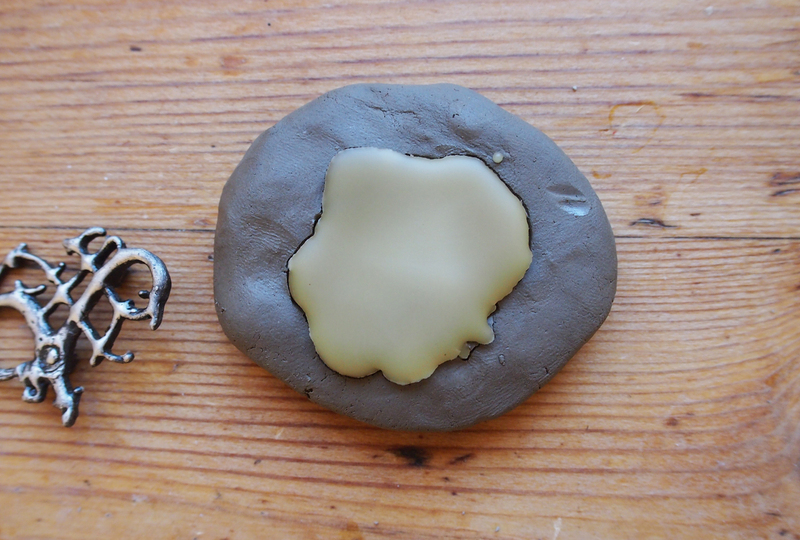 Applying tempered clay to wax models is a tricky procedure when we work with small models of jewellery size. Especially since the water-based material and the fatty wax act as repellents. This means that we need a method that minimizes the risk of trapping air pockets between wax and clay that could create flaws in the finished cast object and yet be able to work quickly when required. 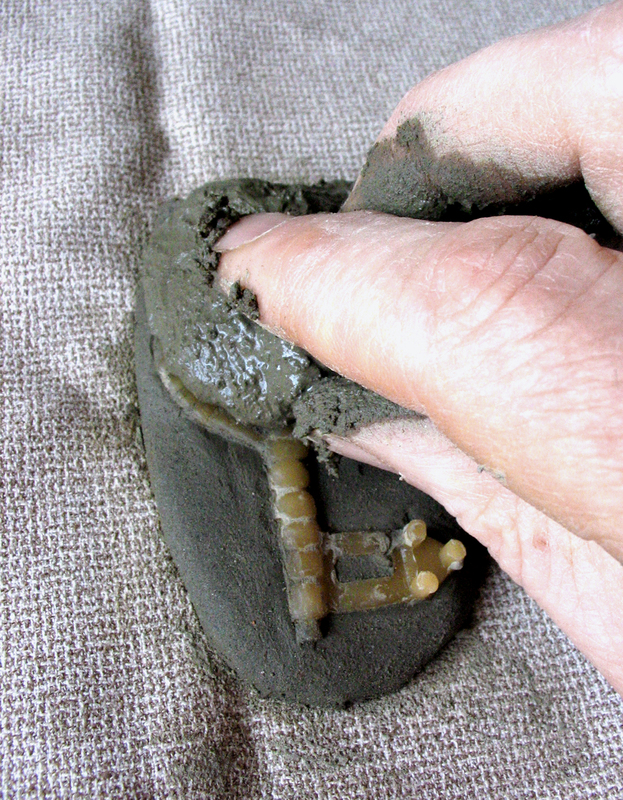 The most natural method, in my opinion, is to start with a little lump of clay mix on a flat surface and press the wax model into it (See Figure 1). 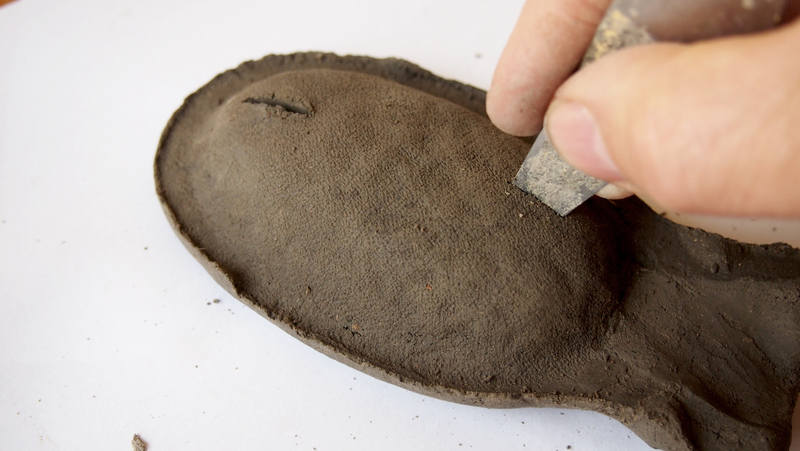 After doing this, the air pockets next to the model that appeared when pressing it in the clay mix must be carefully removed (See Figure 1, right). Then we must wait until the mould material has dried a little and became leather-hard to cover the model with more clay. If we do not, the addition of new clay mix onto the still wet and plastic bottom layer of clay may create new air pockets next to the wax model. Such air pockets will be filled with metal when casting and destroy the result. It may be the properties of the mould material itself, and the way it responds to the fatty wax model, that forces us to use a process that will create “false bivalve moulds” in the end. While waiting, other moulds can be prepared in the same production series. A series of about ten or twenty moulds can easily be prepared like this simultaneously. When the last lower mould part is finished, the first one will be stable enough to cover with an upper layer of clay (See Figure 2). This is a rational procedure that will be most efficient in larger mass-production of specific objects. Every single mould will need a little time to create but you can be very productive and keep up a good speed, while still keeping control of what you do and be assured of an optimal result. After pouring and opening the moulds they are now considered as discarded waste. These are commonly found during archaeological excavations. 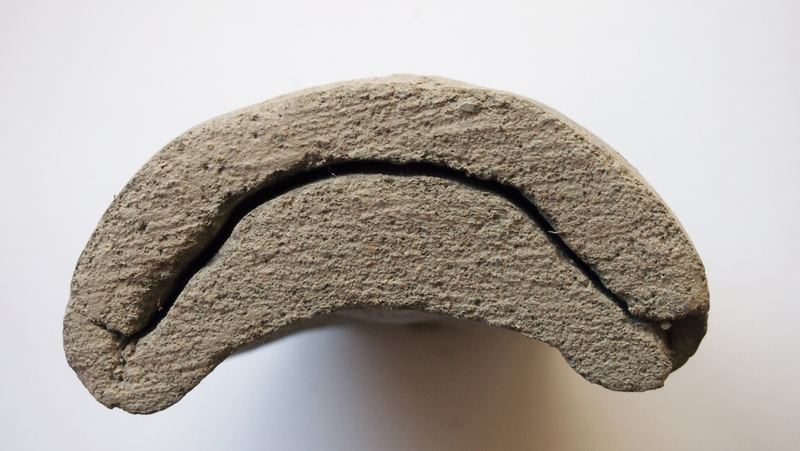 Since clay with different grades of moisture do not stick to each other during drying and firing, the moulds will separate spontaneously along the joint between the lower and the upper parts. 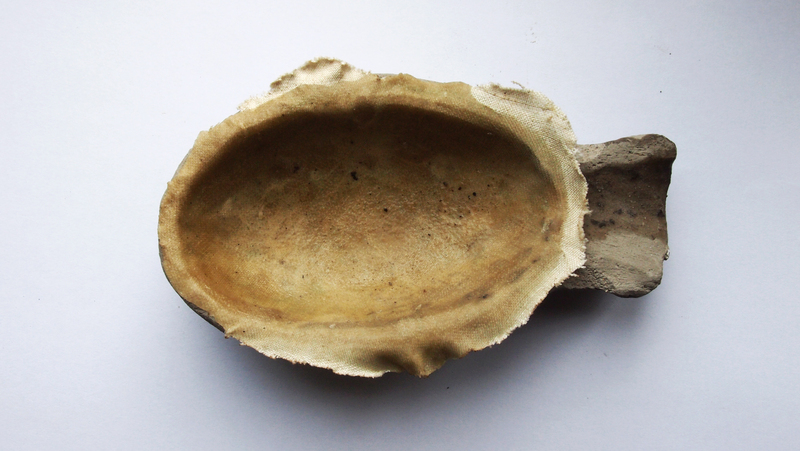 They will simply look like bivalve moulds when we find them in the workshops' waste deposits (See Figure 3). So, does this mean that the use of true two-part moulds is completely ruled out? Not at all, the problem is that earlier interpretations created a polarized situation where one interpretation negated other interpretations. But obviously, both methods have been used. 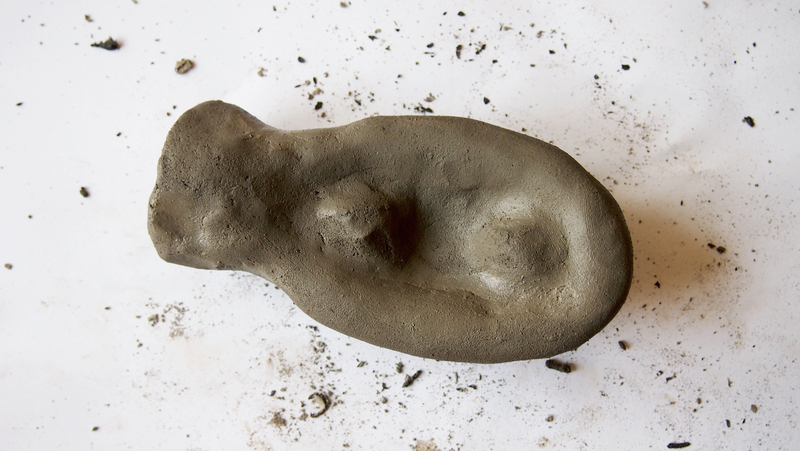 The distinction between a true bivalve mould where you have pressed a metallic model directly into the clay mix, and what I may suggest is a “false” one made by the lost wax method, is not as obvious as one may think. The observable first sign to look for may be keys and keyholes, which help you put the halves together accurately after opening it to take the model out. But even this is not a certain sign when we deal with the production of specific objects, as shown further down in this paper. Keyholes can be studied in mould fragments from the Migration period settlement Helgö, Sweden (See Figure 4), from Pictish layers at Brough of Birsay (Curle, 1982, p.26) and from the Swedish Viking settlement Birka (Ambrosiani and Eriksson, 1992, p.41). 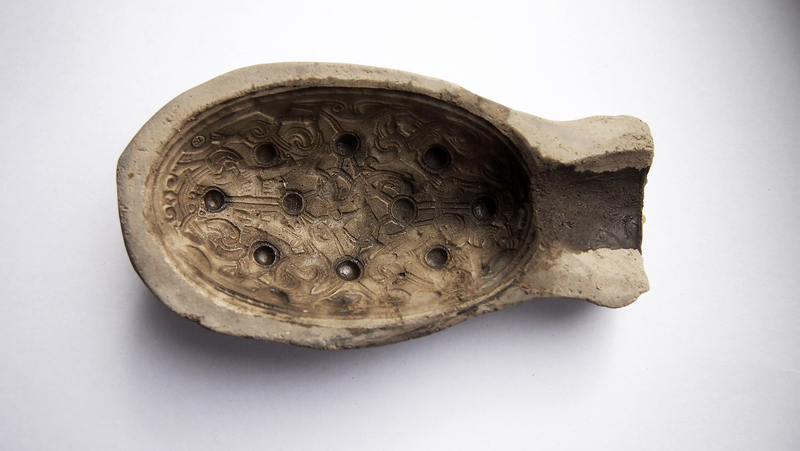 The process of making a mould like this is shown in figures 5 and 6. 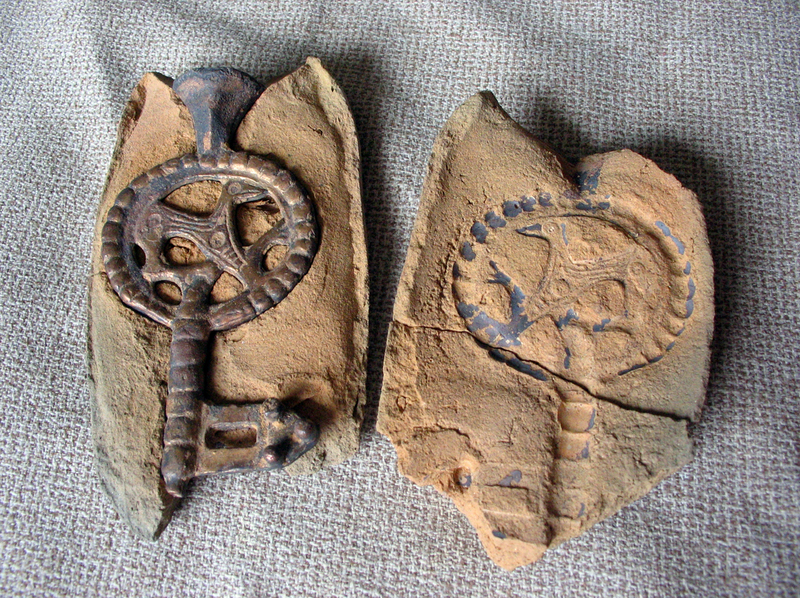 These keys and keyholes are usually missing in Scandinavian Viking period moulds. One of the exceptions are moulds for oval brooches (Brinch Madsen, 1984, pp.33-34) but in this case, they are not necessarily signs of not having been made by the lost wax method. The casting of oval brooches requires the use of a textile cloth in the model making, that must be brought out of the mould before finally closing it, firing it and pouring metal into it. 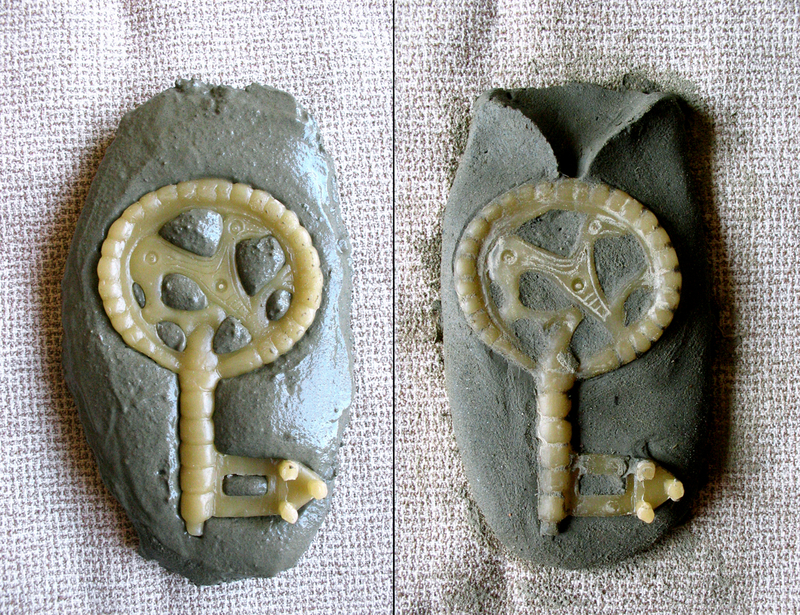 So, if the use of keys and keyholes are not reliable signs of making moulds by the direct method – is the absence of them a reliable sign of using the lost wax method? No, not necessarily. You can put together two mould halves without keys and keyholes, at least with an acceptable accuracy. The only way to make a certain analysis of the mould making method is through the surface structure analyses on cast objects that are in good condition with their original surfaces intact. Mould making with the different methods gives different qualities to the surface registration in the moulds, differences that will be transferred to the cast object. As the surface of the cavity in a lost wax mould will be protected from air by the wax model during drying, it will retain a full accuracy of the model. When making a mould with the direct method, the model must be brought out of it before the mould dries, shrinks and cracks around the stiff model material and before it has lost its plasticity – the very little plasticity that is left in a clay that may be tempered with up to 57–63% of sand and 3,47– 5,54% organic material (% by dry weight, cf. Brinch Madsen, 1984, p.33). This implies that during the last part of the drying process, the registration inside the mould will be exposed to air, and you will attain uneven surfaces due to the different fractions of materials in the clay mix. The clay itself will shrink more than the embedded grains of sand or silt (See Figures 7 & 8). This will be visible in the mould, and therefore also in the cast object. Another way to analyze this is to study punched pattern details on the cast objects. Were they punched into the finished metallic object or were they pressed in the wax model? 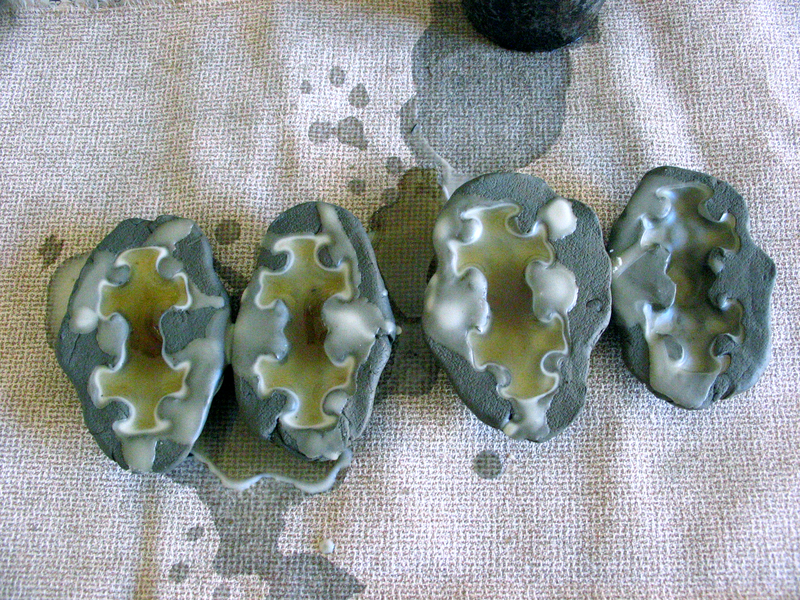 A pattern detail that is punched in the cast object will show a smooth surface, while a “punched” pattern that was created already in the wax model will show a different surface due to the emergence of dendrites and interdendritic pores in the cast object, crystalline patterns that emerge during the solidification of the metal (Meeks, Craddock and Needham, 2008, p.17 and pp.24-25). These patterns are visible all over the surfaces of cast metal objects, but if you punch it the punch marks will smooth these patterns out. The dendritic patterns set the limit for the registration of fine details when working with the lost wax technology. The considerable larger irregularities of the surface that emerge during the drying of the mould will set the limit for a mould made by pressing a metallic object directly into clay mix. The lost wax method allows fair registration of details down to the size of fractions of a millimetre. Chevron patterns on a Bronze Age gold object analyzed by Meeks, Craddock and Needham were just up to 0.2–0.3 mm wide. These thin chevron patterns were not punched, they were cast, as there are visible dendritic patterns in them (Meeks, Craddock and Needham, 2008, p.19, Fig. 3). 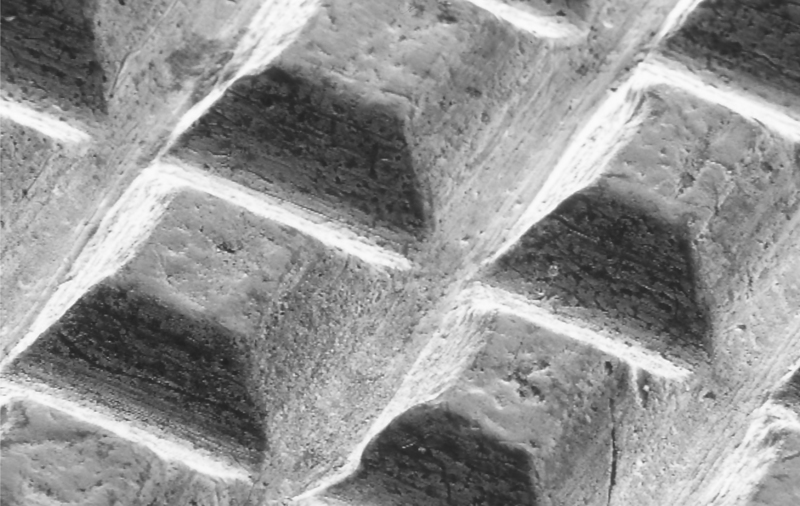 The difference between the surface of a filed master model and a pattern cast from a wax copy are visible in the scanning electron microscope (SEM) images in Figures 9 and 10. The flat squares on top of the pyramids are just about 0.1 mm wide. The pictures show the possibilities of lost wax casting in Late Iron Age/early medieval style ceramic moulds, and also the limits. The accuracy is not limited by the mould material itself, but by the dendritic surface pattern that appears in the solidifying metal. Still, this shows that you can reproduce astonishingly small details by casting in ceramic moulds. 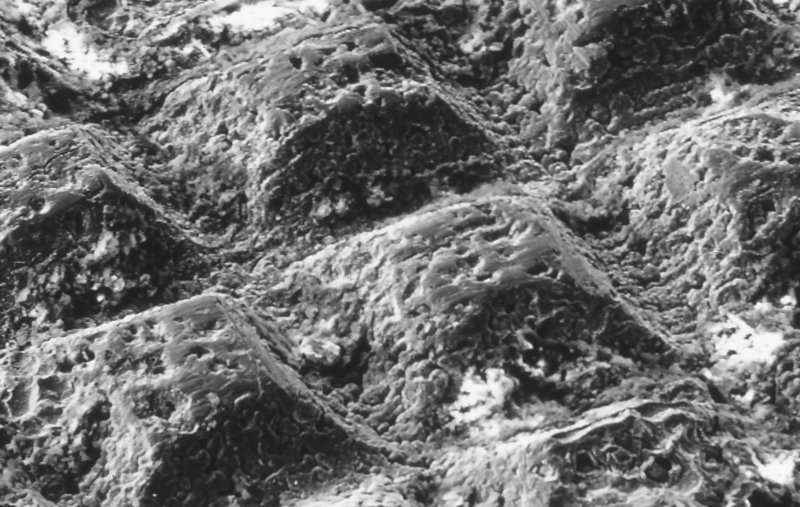 In this case, the interdendritic pores are just 0.02–0.03 millimetres wide. 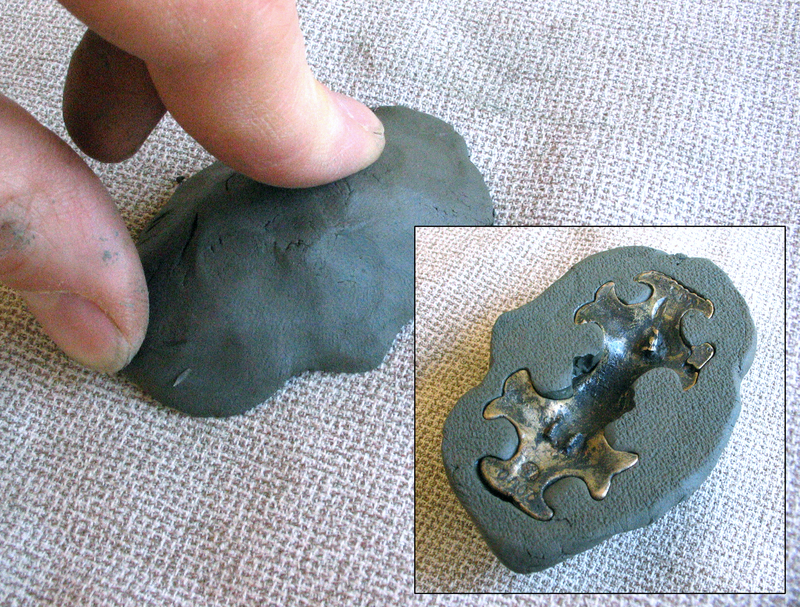 Jansson (1981, p.5; 1985, p.12) suggested that Viking oval brooches may have been reproduced by filling an impression in untempered the clay of an original model with wax. Hedegaard discussed this method further in a work about Merovingian period fibulae and called the method “the wax copy method”. He estimated that by pressing an original fibula in soft clay and filling the impressions with wax, as described in figures 11–14, it would be possible to produce 60 wax copies within half an hour. His conclusion from this was that a team of three goldsmiths would be able to cast 1000 fibulae per month working seven hours a day (Hedegaard, 1992, pp.77 ff). Brinch Madsen and Lønborg describe the reproduction of Viking oval brooches in the way Jansson suggested and put forward plausible explanations to the positive textile patterns on the reverse of the cast brooches (Brinch Madsen, 1984, pp.91 ff; Lønborg, 1992). A good illustration of their suggested process is shown by Jensen (1991, p.32). 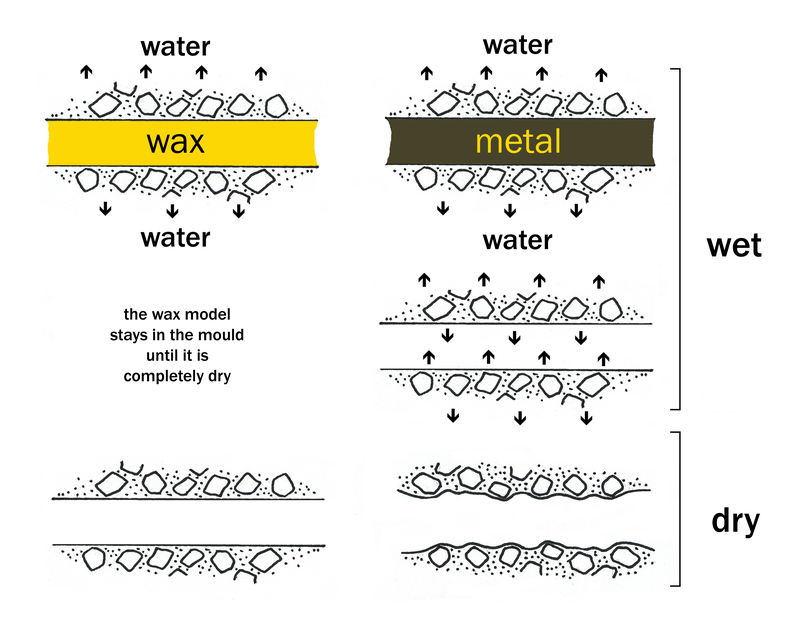 Making models by pouring wax into impressions in wet, plastic clay is an advantageous method: it provides surprisingly good results concerning the registration of patterns, and it is a fast method as many wax models can be reproduced simultaneously by means of one single original model (See Figure 14). The quality of registration may sometimes demand a slight manual retouching work, or sometimes you may wish to individually touch up the copies, making them a bit unique. We see this in the oval brooches of the P42 type, from the burial fields in the Viking marketplace Birka in Sweden. The overall decoration is generally symmetric. You can see deviations in the symmetry of individual pattern fields, deviations that are the same for several brooches, but the smaller details of the decorations themselves may be very different from brooch to brooch (cf. Arbman, 1940, plate 63, Fig. 3, 4 & 5a; Jansson, 1985, p.61, Fig. 49). Obviously, these were reproduced from the same original model, but the ornaments were individualized by making changes in the wax models before making the moulds. 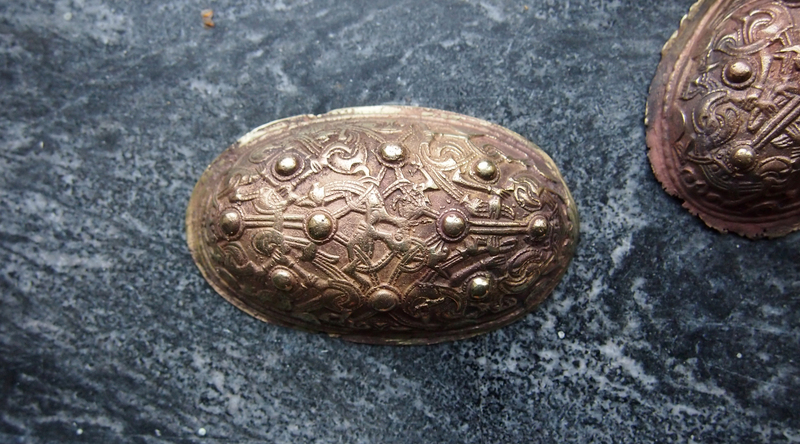 An example of reproducing originals by the wax copy method is shown in Figure 16, an Urnes brooch from Vindeballe, Ærø, Denmark. It has probably been reproduced in wax just as the example in figures 17–20. 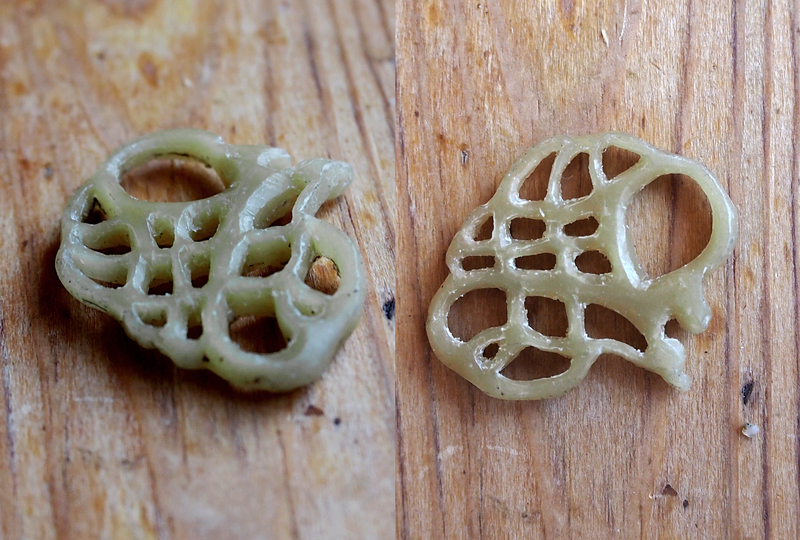 After the wax model was released from the clay, the holes were cut open and slightly widened at the reverse. The distinctive widenings of the holes we see on the brooch were not filed in hard metal after casting. They were probably cut in the soft wax before making the mould. 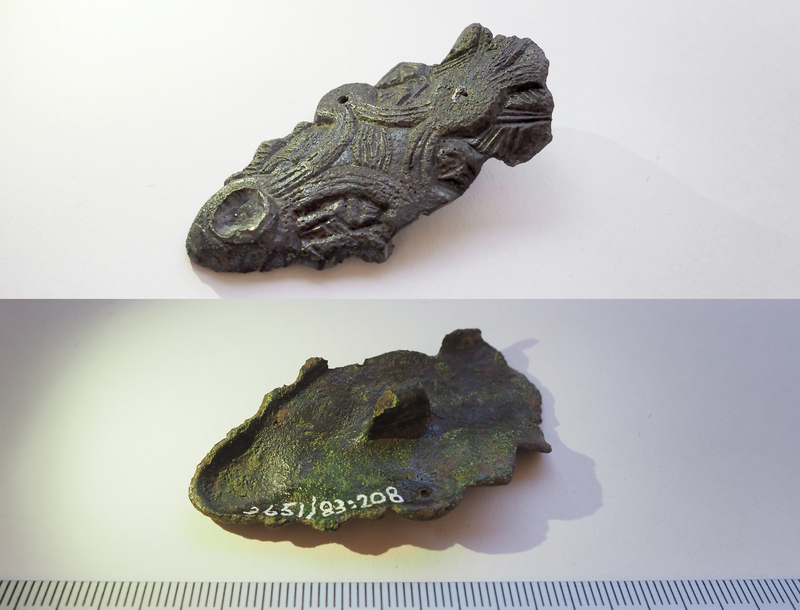 An example from late Iron Age Sweden of what may be a unique lost wax casting is a little golden amulet found in the remains of a cult building from a settlement in Lunda west of Stockholm, dated 450–600 AD (See Figure 21). We are lucky in this case that the amulet was made of a gold alloy that does not corrode, the surface condition is still splendid. The amulet has been interpreted as cut out from a solid metal rod (Andersson and Beronius Jörpeland, 2004, pp.46 ff, p.160). Nevertheless, the grooves that represent the hands, the belt and the neck all show features of having been hastily sketched in a soft material. Especially the grooves forming the belt and the neck that have not even been made with a sharp tool, but rather a blunt edged tool. Gold is a soft metal in its pure state, but this amulet is made of electrum – in this case an alloy of 60–70 % gold, 25–35 % of silver and a few percent of copper (Grandin, 2003). Electrum is harder than gold. It is difficult to believe that this alloy would enable the craftsman to work as swiftly as we see here in terms of fast sketching the little deity's hands. The grooves are made in a material that didn't have resistance to the tool. That material could be wax or a similar material. If so, the amulet was cast, not cut in cold metal. 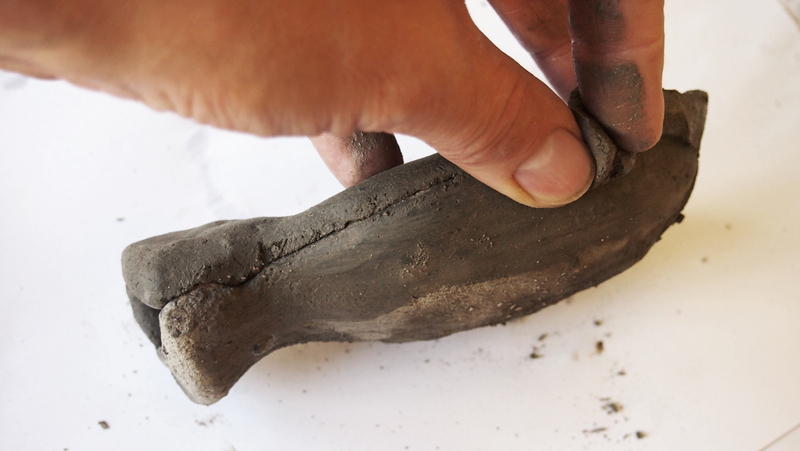 Yet another striking example is a fragment of a ceramic mould for the casting of a silver armlet, found in a workshop in Fröjel, Gotland (Söderberg and Gustafsson, 2006). The fragment shows negative hourglass-shaped “punch marks” (See Figure 22). Since they are visible already in the mould they obviously have not been punched on the final metal product after casting but pressed into the model already before making the mould. 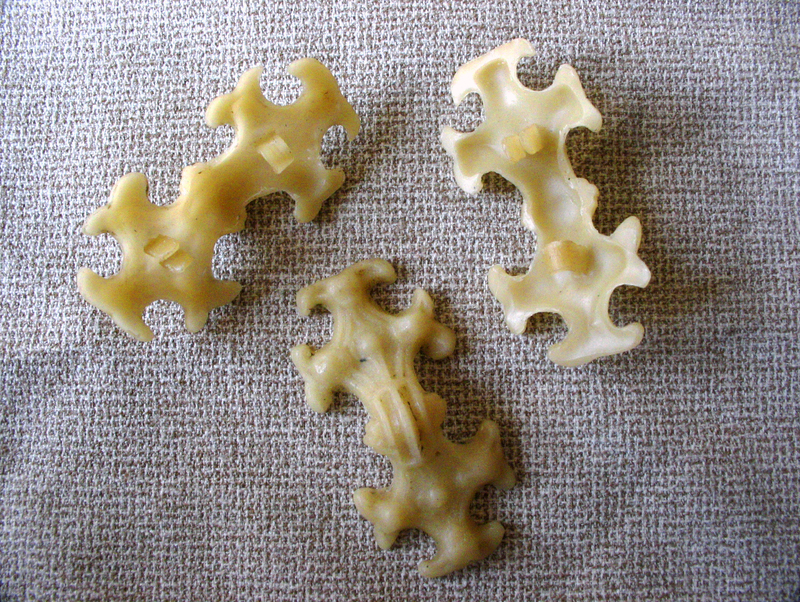 It is advantageous to make even small decorative patterns like this in the wax models. Wax is so much more easily worked than metal. Once again it must be emphasized, that you cannot tell how a pattern of a metal ornament was made until you have examined it with an SEM and ruled out the occurrence of dendritic patterns on the bottom surfaces of the punch marks. If there are dendritic patterns, the ornamentation was without doubt made prior to casting (cf. Meeks, Craddock and Needham, 2008, pp.17-18, pp.24-25). 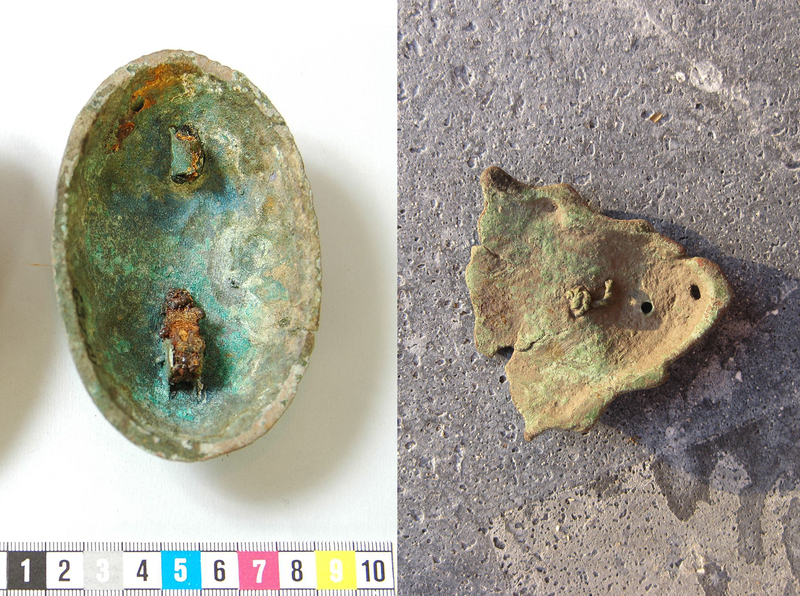 This is, of course, a weakness in this study, that neither the golden deity from Lunda nor the Urnes brooch from Ærø have been examined in this manner, so using them as plausible examples of lost wax casting must be considered as hypothetical. 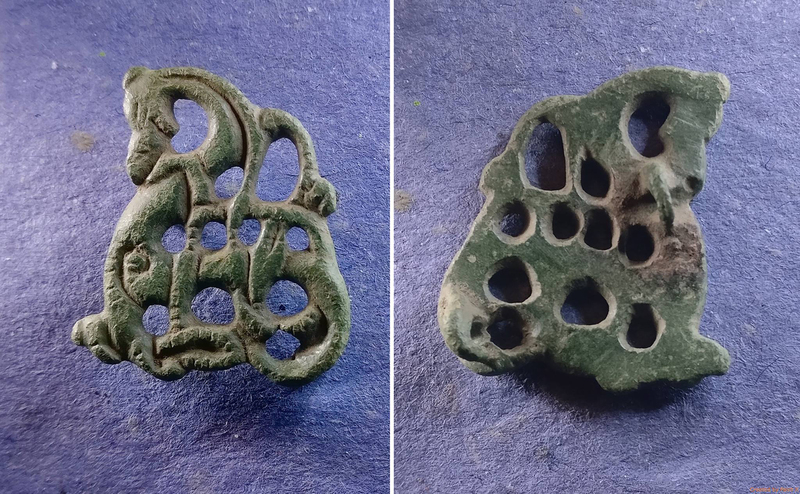 Nevertheless, it is easy to consider that many of the punched decorations, the ring-and-dot decorations, and the chip-carving patterns that we see on Iron Age and early medieval jewellery were made in wax models prior to mould making (cf. Hedegaard, 2002). An even earlier indication of the use of this procedure is convincingly shown in Bronze Age spiral patterns on Danish belt plates, experimentally examined by Rønne (1991). Sometimes we find the remark that lost wax must be an irrational and slow method, as a new model must be created prior to each casting. As a matter of fact, the reality is the other way around – the method provides an excellent copying method for fast large-scale serial reproduction. Hedegaard (1992) estimated that up to 120 wax copies for smaller fibulae could be made from one single original model within one hour's work. Above that, he estimates that five hours will be needed for the retouching of flaws in the ornaments, attaching pin arrangements of wax to the reverse sides, and finally, he estimates the potency for making moulds from the wax originals to 20 moulds an hour. 120 moulds could be finished within a 12-hour working day. When estimating time in a similar way for making moulds by pressing an original model in the mould material, we find that each mould will need one hour and ten minutes to make. The original model will be locked-up inside the drying mould during that time; 10 minutes of modelling and 2 x 30 minutes (two times because there are two mould halves) of drying before the model can be brought out of the mould. Since the original model will be locked inside the mould during the process, we can make a maximum of 10 moulds within 12 hours. There was an experimental comparison made on this earlier that estimates a need for one hour and forty minutes of work for each lost wax mould (Söderberg, 2001), but that study did not take into account the possibility of making several moulds simultaneously. 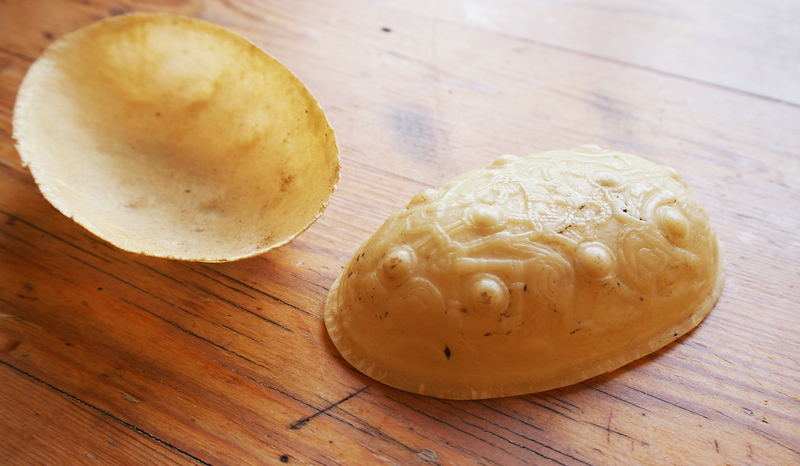 It also estimated the time for making a mould by the direct method to four and a half hours, but that estimation was made for making very complex moulds consisting of six parts, and a little more than one hour would be more accurate for a common bivalve mould. As mentioned above, no moulds can be made simultaneously in this case as the original model will stay in the mould until it is dry enough to open to bring the model out. The different methods show dramatic differences in production potential. I would not say anything about the actual need for a fast production speed a 1000 years ago, we do not know anything about that, but it shows that the argument that lost wax is not a fast reproduction method is definitely not right. The slow one is the direct method, pressing the metal model into the mould and this is also the method that gives the poorest results. An intriguing phenomenon that sometimes occurs on Viking jewellery is textile patterns on the reverse. The most common example is the oval brooches (See Figure 23, left), but you can in many cases find them on slightly smaller objects as well (See Figures 15 and 23, right). The patterns are always positive which indicates that the textile must have been a part of the modelling and moulding process. They are not the results of corrosive processes connected to textiles lying next to the objects for centuries after burial in soil. They are not impressions, but positive patterns in the cast metal. The cloth patterns have been subject to a long ongoing debate in Scandinavia (cf. Zachrisson, 1960; 1964; Oldeberg, 1963; 1965; Arrhenius, 1973, p.101; Brinch Madsen, 1984, p.92; Jansson, 1985, p.117; Lønborg, 1992; 1998, p.22; Trotzig, 2014, pp.182 ff). The discussion has resulted in many imaginative theories concerning the function of the cloth. It was already at an early stage clear that the patterns are mainly of a functional nature, not ornamental. There are two plausible explanations. 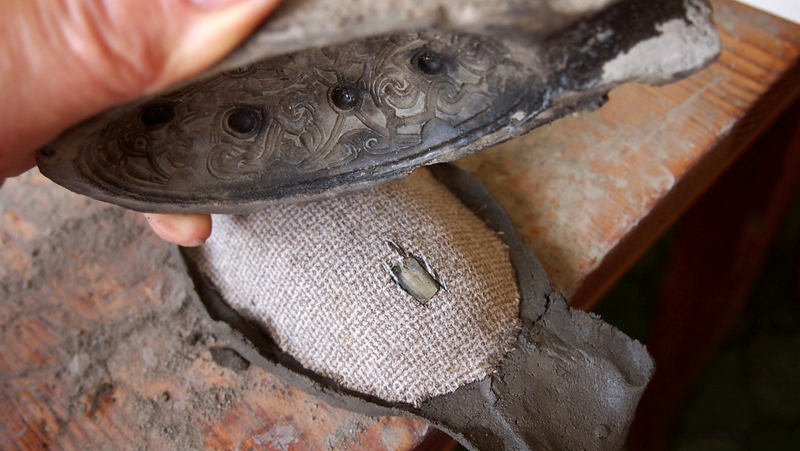 The textile, that is depicted in the brooches, may have been used when the lower mould part was made, to set the thickness of the cast goods by creating the space between the two mould halves. After the front piece of the mould was made – the piece with the ornamentation – from a solid model made by the wax copy method (See Figures 24 and 25), a waxed cloth was formed into the desired a shape and put in the mould before making the reverse mould part (See Figures 26–28). 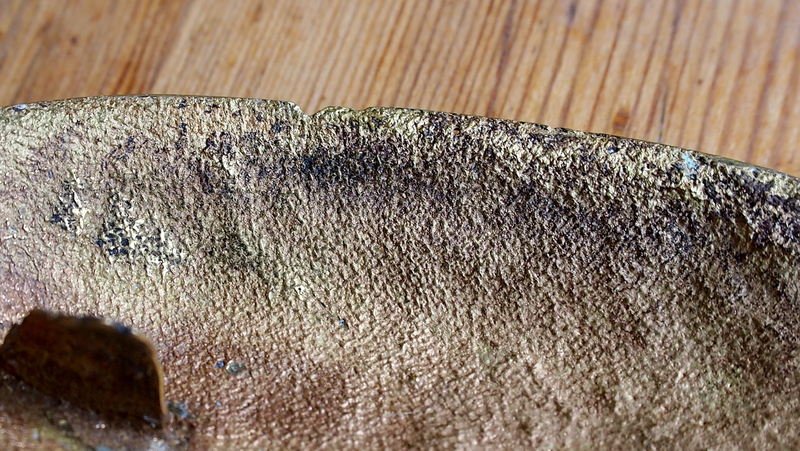 After drying (See Figures 29–30), the mould could be opened after slight heating and the cloth was then brought out. Then the mould was closed again, sealed at the joints and left to dry completely prior to firing. The cloth would now have left a negative textile imprint on the back part of the mould, an imprint that would create a positive pattern on the reverse of the finished brooch after casting (Brinch Madsen, 1984; Lønborg, 1992; 1998). An alternative variation of the technology could be to completely skip the step of soaking the cloth in wax. This preparation is not necessary, neither for making the cloth waterproof nor for making it thick enough, according to my own experience (See Figures 31–36). Another possible explanation that seems just as plausible, but that I have not found described in research thus far, is that the cloth could have been used to reinforce a very thin wax model. 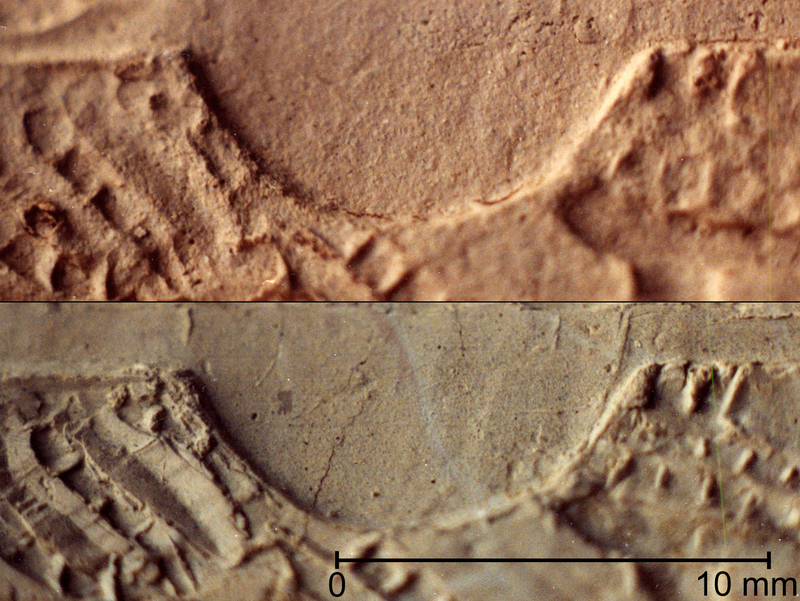 Jansson (1981) and others suggested the reproduction method for making wax copies by casting solid wax copies in clay imprints, as described above. It is also possible to create copies with the desired thickness of the final goods already at this stage, by putting a piece of cloth that you have shaped slightly concave-convex into the clay impression before pouring the wax. Immediately after the wax is poured in and it has moved through the cloth, you can pour the excess out without risking the ornamental patterns, as the wax on the far side of the cloth next to the ornaments in the mould already quickly has solidified due to the chilling effect of the wet clay. The result is an extremely thin wax model with a nice reproduction of the ornamental patterns, reinforced by cloth and thus stable enough to allow the making of desired changes or retouches of the patterns without breaking (See Figure 37). In this way, the thickness of the model sets the thickness of the goods in the final cast product. In both examples, the cloth needs to be brought out from the mould prior to firing it. 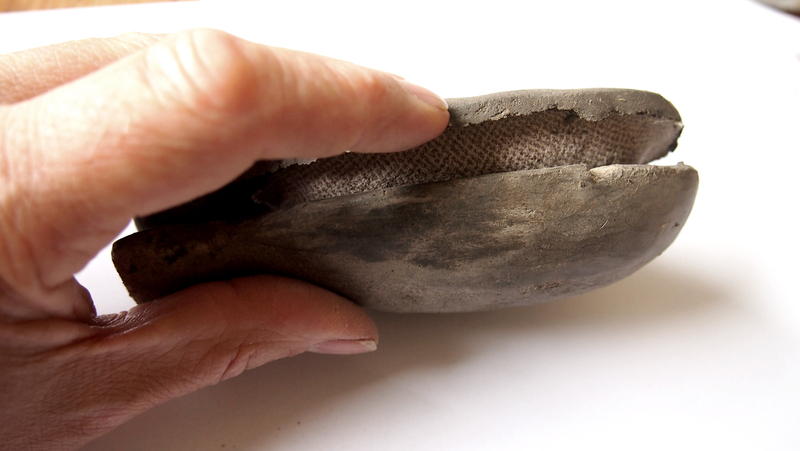 Even though the cloth will burn during firing the remaining charred textile or ashes will affect your casting – carbon does not absorb liquid metal, rather they repel each other. The remains of the textile will destroy the result by creating holes in it, something we do not want to risk. 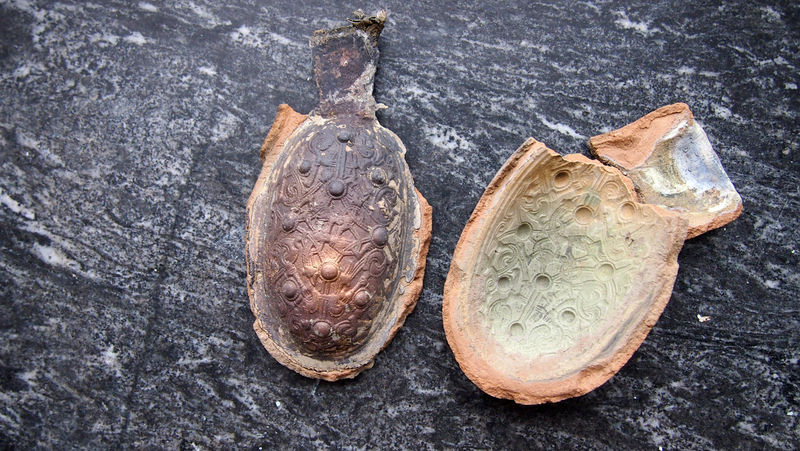 This is one of the reasons why you need to make these moulds as bivalve moulds even though they are made by the lost wax technology – a fact that never is considered when claiming that Iron Age and Viking moulds could not be lost wax moulds because they were made of two parts. This is also a reason for the need for keys and keyholes even when we are dealing with the lost wax method. 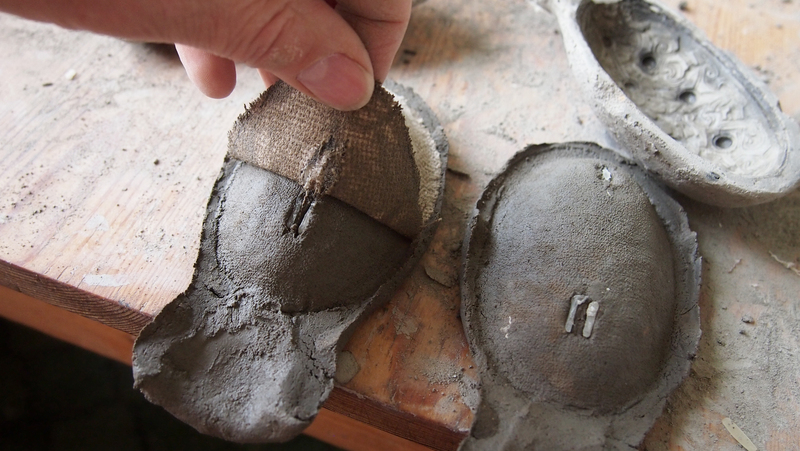 We must be able to put the two parts of the mould together accurately after removing the cloth. Keys and keyholes can be studied on mould fragments from the casting of oval brooches from Ribe, Denmark (Brinch Madsen, 1984, p.33). Which of the two methods that were used is hard to tell, as the cast results will look very similar to each other (See Figures 38–41). Perhaps both methods were used, by different craftsmen or in different situations? From my experience, though, the reverse of my brooches made with the method using textile that have not been waxed (Figure 40), looks very similar to what I have seen in the archaeological brooches. You can even see a slight unevenness on the inner surface, mirroring the ornamental details at the front side of the brooch, in the same way as we can study in the original artefacts (cf. Jansson, 1985, p.117, Fig. 106). 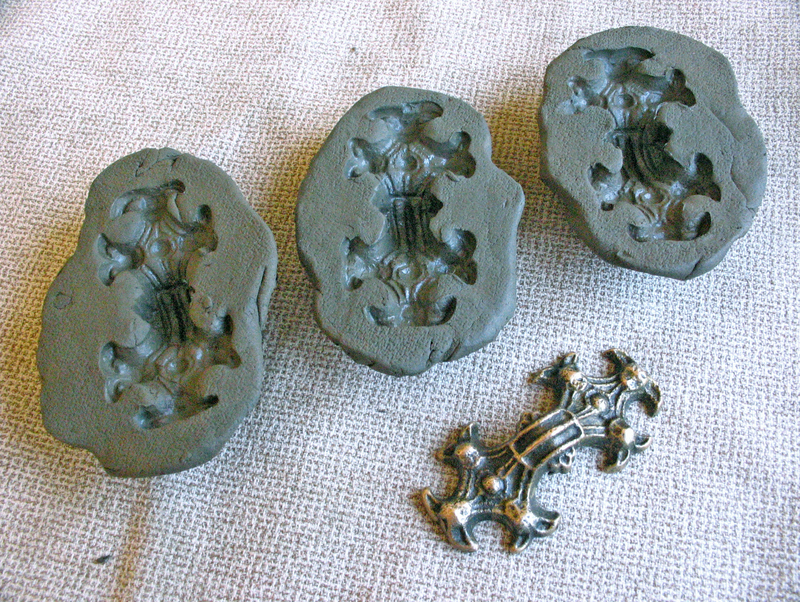 According to my experience, I can conclude that Jansson probably hit very close to the truth in the eighties, when suggesting the use of the wax copy method when making moulds for Viking oval brooches. It is important to emphasize that two-part moulds are not evidence against lost wax casting, the reality is far more complex. As mentioned, the only reason why you would deliberately create a mould in two parts is that you will need to open it and take something out. This “something” could be a model of solid material prior to casting, it may be the cast object after casting so that you could use the mould once again, or it could be a piece of textile used in a wax model – a cloth that must be brought out from the mould before firing it. The last alternative is an important one that rarely have been emphasized by research. Ambrosiani, B., 2013. Excavations in the Black Earth 1990–1995. Stratigraphy Vol. 1. Birka Studies 9. Stockholm: Birka Project. Ambrosiani, B. and Eriksson, B.G., 1992. Birka, Vikingastaden, Volym 2. Stockholm. Andersson, G. and Beronius Jörpeland, L., 2004. Dunér. S. Fritsch, & E. Skyllberg (eds) Att föra gudarnas talan. Stockholm. Arbman, H., 1940. Birka: Untersuchungen und Studien. 1, Die Gräber: Tafeln. Kungliga Vitterhets Historie och Antikvitets Akademien. Stockholm: Almqvist & Wiksell. Available at: <http://historiska.se/birka/digitala-resurser/filer/pdf/Birka_I_Tafeln.pdf> [Accessed 15 July 2018]. Brinch Madsen, H., 1984. Metal Casting. In: M. Bencard, ed. Ribe Excavations 1970-76. Vol 2. Esbjerg: Sydjysk Universitetsforlag. Curle, C.L., 1982. Pictish and Norse finds from the Brough of Birsay 1934-74. Society of Antiquaries of Scotland Monograph Series 1. Aberdeen: Waverly Press. Available at: <http://archaeologydataservice.ac.uk/archives/view/psas/monograph01.cfm> [Accessed 15 July 2018]. Grandin, L., 2003. Tre gudastaatyetter från Lunda. Kemiska analyser. Rapport UV GAL 11-2003. Uppsala. Hedegaard, K. R., 1992. Bronzestøberhåndværket i yngre germanertid og tidlig vikingetid i Skandinavien - teknologi og organisation. Lag 1992. Højbjerg: Aarhus Universitet. pp.75–93. Hedegaard, K. R., 2002. Stempelornamentik i yngre germanertid – teknik og formål. In: M.B. Henrikson, ed. Metalhåndværk og håndværkspladser fra yngre germansk jernalder, vikingetid og tidlig middelalder. Rapport fra et seminar på hollufsgård den 22. oktober 2001. Skrifter fra Odense bys Museer vol. 9. Odense: Odense Bys Museer. pp.41–47. Available at: <http://museum.odense.dk/media/211508/metalh%C3%A5ndv%C3%A6rk.pdf> [Accessed 15 July 2018]. Jansson, I., 1981. Economic Aspects of Fine Metalworking in Viking Age Scandinavia. In: D.M. Wilson and M. Caygill, eds. Economic aspects of the Viking Age. British Museum Occasional Paper No 3. London: British Museum. pp.1–17. Jansson, I., 1985. Ovala spännbucklor: en studie av vikingatida standardsmycken med utgångspunkt från Björkö-fynden. Oval brooches: a study of Viking Period standard jewellery based on the finds from Björkö (Birka), Sweden. Uppsala: Uppsala Universitet. Jakobsson, T., 1996. Bronsgjutarverkstäderna på Birka – en kort presentation. In: H. Forshell, ed. Icke-järnmetaller, malmfyndigheter och metallurgi, Föredrag från symposium på Jernkontoret den 16 mars 1995. Jernkontorets bergshistoriska utskott. Stockholm: Jernkontoret. pp.71–75. Jensen, S., 1991. Ribes Vikinger. Ribe: Den antikvariske Samling. Korosuo, O., 1946. Gjuttekniken under järnåldern i Finland. Finskt museum LIII. Helsinki: Finska Fornminnesföreningen. pp.5–30. Lamm, K., 1972. Clasp buttons. Excavations at Helgö IV. Workshop part 1. Kungliga Vitterhets Historie och Antikvitets Akademien. Stockholm: Almqvist & Wiksell. pp.70–131. Lamm, K., 1980. Early Medieval Metalworking on Helgö in Central Sweden. In: W.A. Oddy, ed. Aspects of Early Metallurgy. British Museum Occasional Paper No 17. London: British Museum. pp.97–116. Lønborg, B., 1988., Bronzestøbning i dansk jernalder. In: P. Kjærum, ed. Kuml 1986. Årbog for Jysk Arkæologisk Selskab. Aarhus: Aarhus Universitet. pp.77–94. Lønborg, B., 1992., Fremstilling av vikingetidens skålformade fibler. In: P. Kjærum, ed. Kuml 1991-94. Årbog for Jysk Arkæologisk Selskab. Aarhus: Aarhus Universitet. pp.151–164. Lønborg, B., 1998. Vikingetidens metalbearbejding. Odense: Odense Universitetsforlag. Meeks, N.D. and Holmes, R., 1985. The Sutton Hoo Garnet Jewellery: an examination of some gold backing foils and a study of their possible manufacturing techniques. Anglo-Saxon Studies in Archaeology and History 4. Oxford: Oxford University School of Archaeology. pp.143–157. <https://exarc.net/issue-2012-3/ea/precision-lost-wax-casting> [Accessed 15 July 2018]. Meeks, N.D., Craddock, P.T. and Needham, S.P., 2008. Bronze Age Penannular Gold Rings from the British Isles: Technology and Composition. Jewellery Studies, 11, pp.13–30. Oldeberg, A., 1963. Till frågan om de ovala spännbucklornas tillverkningssätt. Fornvännen 1963, pp.1–19. Available at: <http://samla.raa.se/xmlui/bitstream/handle/raa/1941/1963_001.pdf> [Accessed 15 July 2018]. <http://samla.raa.se/xmlui/bitstream/handle/raa/1977/1965_151.pdf> [Accessed 15 July 2018]. Pedersen, U., 2010. I smeltedigelen. Oslo: Universitetet i Oslo. Rønne, P., 1991. Førsøgsarkeologi og bronzealderens ornamentik. In: B. Madsen, ed. Eksperimentel Arkæologi, studier i teknologi og kultur. 1/1991. Viborg. pp.32–49. 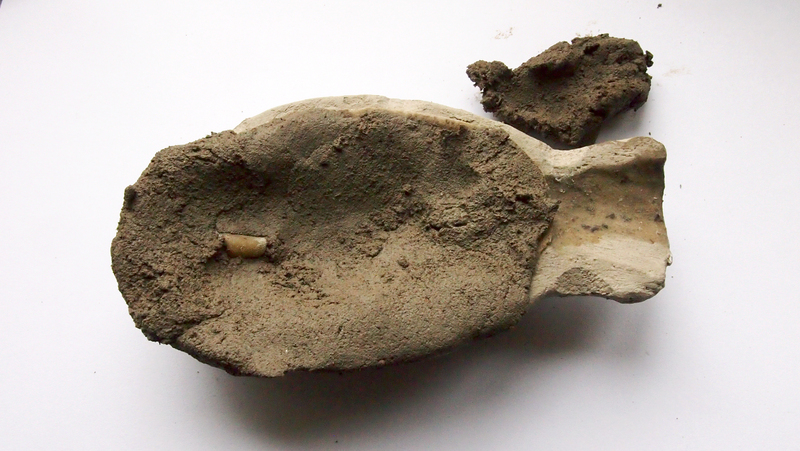 <https://exarc.net/issue-2012-3/ea/scandinavian-iron-age-and-early-medieval-ceramic-moulds-lost-wax-or-not-or-both> [Accessed 15 July 2018]. Söderberg, A. and Gustafsson, N.B., 2006. A Viking Period silver workshop in Fröjel, Gotland. Fornvännen 2006, 101(1), pp.29–31. Available at: <http://samla.raa.se/xmlui/bitstream/handle/raa/3111/2006_029.pdf> [Accessed 15 July 2018]. Thunmark-Nylén, L., 1983. Vikingatida dosspännen – teknisk stratigrafi och verkstadsgruppering. Aun 4. Uppsala: Uppsala Universitet. Trotzig, G., 2014. Metaller, hantverkare och arkeologi. Från forntid till nutid. Stockholm: Hemslöjdens förlag. Zachrisson, I., 1960. De ovala spännbucklornas tillverkningssätt. Tor VI. Uppsala: Uppsala Universitet. pp.207–238. Zachrisson, I., 1964. Till frågan om de ovala spännbucklornas tillverkningssätt. Ett genmäle. Fornvännen 1964, pp.42–45. Available at: <http://samla.raa.se/xmlui/bitstream/handle/raa/1966/1964_042.pdf> [Accessed 15 July 2018]. Fig 39. The finished oval brooch.